A demon born from the ground where the Son of Chaos dropped the ring from his sisters intended to ease his pain. A somewhat humanoid demon with centipede-like tail. At the lowest point of Demon Ruins. Several steps before the boss entrance, next to a root. The tail will grow back repeatedly given enough time. Each tail killed yields 500 souls. You can actually see him from near the second bonfire in the Demon Ruins. Easily seen up close by the corpse with the Soul of Proud Knight. He is completely immune to Fire damage. Solaire has the Orange Charred Ring equipped, so fret not if he does walk into the lava. At range - Sends out a single arm, which can be easily dodged by rolling sideways. Ranged players can then attack him, but melee players will have to wait it out until he moves in close. Low health - releases three homing fireballs when you are at range. His high jump attack also gains an explosion (identical to the Demon Firesage) directly beneath him. Close range - High jump attack which can knock you into lava and removes your targeting reticule. Standing too close in front of him (or under him) will cause him to grab you and chew on you, dealing a large amount of damage, however it can be dodged. The grapple damage can be reduced/avoided if you press the shoulder buttons in rapid succession once grabbed. He also possesses the ability to stomp his feet alternately to make sure you do not do too much damage to his vulnerable legs. The stomp always starts with his right foot. Stay closer to his left foot and keep the right one in view. You should have time to roll out of the way when the right foot starts. After a while he will return to the open lava and begin his cycle again. Take a right onto the area with the dead body, as it is much easier to stay out of the lava here. 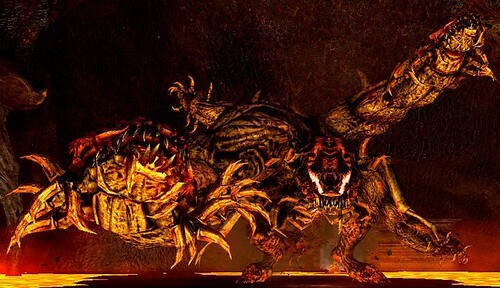 Now get the Centipede demon to follow you by dodging his grab and arm swing attacks. Once on the section of land with the dead body, run underneath it while it is standing on its hind legs, and start continuously swiping at its hind legs, and if you want to attack the tail for the Orange Charred Ring. This ring will help you greatly if you are having issues with the lava damage. Usually the centipede should not be able to hurt you at all down here, especially if you have a hard hitting weapon. Cast the spell before the battle. First roll across to the small island, then the large one. Don't jump. Proceed to attack the demon with the halberd. You should dodge most of his attacks but occasionally block them. In case of the Centipede Demon, you can cut off his tail and his arm. The tail has about 6.64% and the arm has about 8.74% of Centipede's HP. If he grabs a phantom or a player near the wall close to the entrance, he may disappear through the wall. He then dies, awarding the player with his drops.